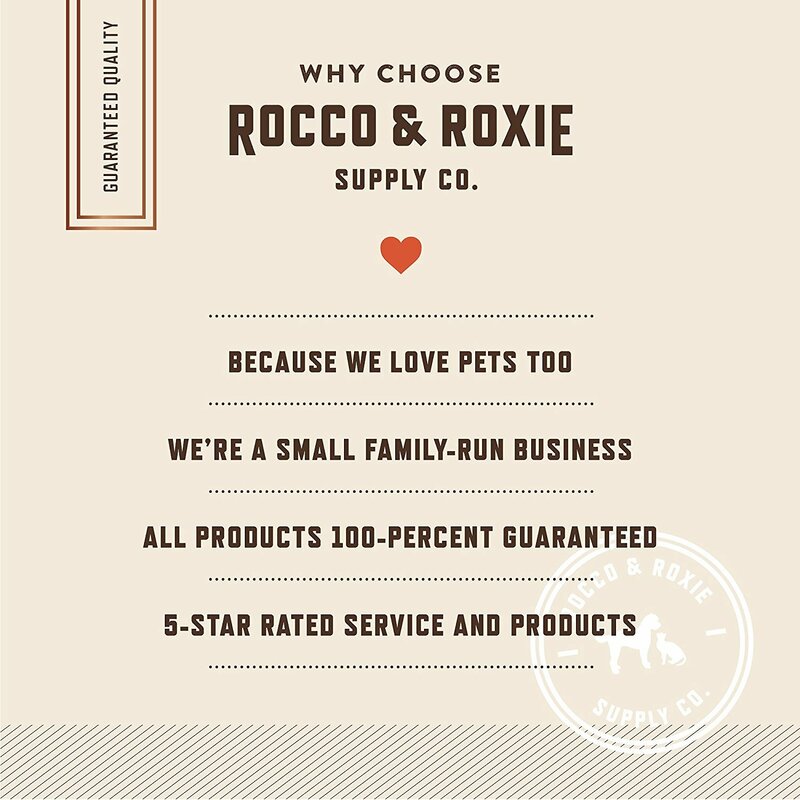 Offer your precious pup a meaty, healthy snack that’s sure to get his tail wagging with Rocco & Roxie Supply Co. Gourmet Chicken Jerky Dog Sticks. 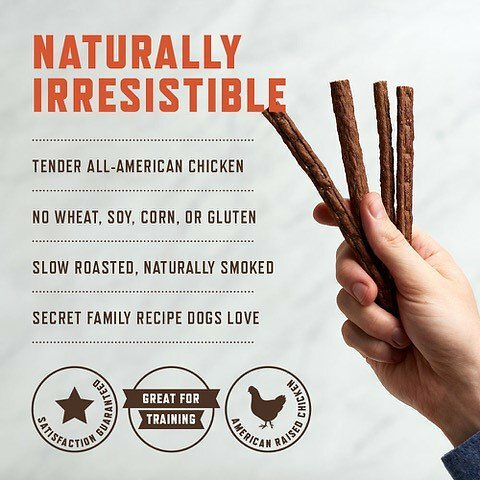 Made from a secret family recipe your dog is sure to love, the first and main ingredient is high-quality, American-raised chicken that’s been slow-smoked with hickory wood for 10 hours to achieve a natural smoky flavor. 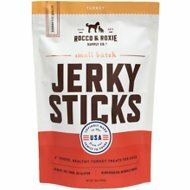 Featuring a soft, meaty texture that even the fussiest dog will gobble up, these paw-sitively delicious treats also make the perfect training reward when broken into smaller pieces. Premium 6-inch jerky treats are made with real American-raised chicken and the highest quality ingredients. I have three small dogs and they are very picky eaters. 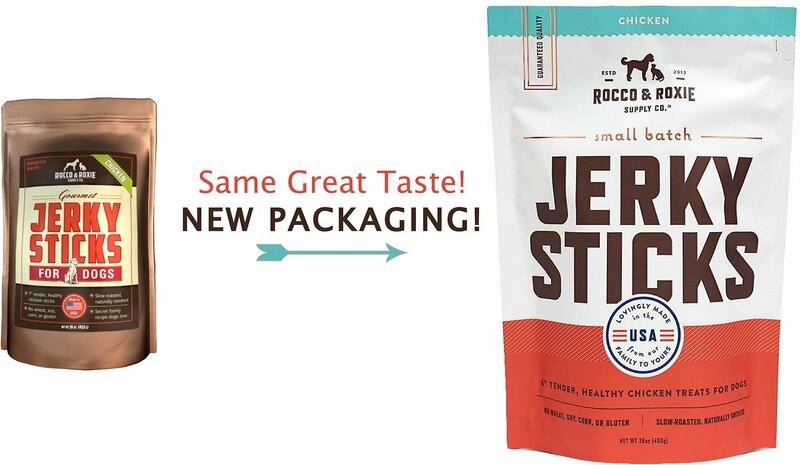 They love Jerky Sticks and best of all, they don't get loose stools which means the ingredients are good. I cut them up in small places and use them as payment for our pets when they follow me upstairs to work. Most days they beat me up the stairs. 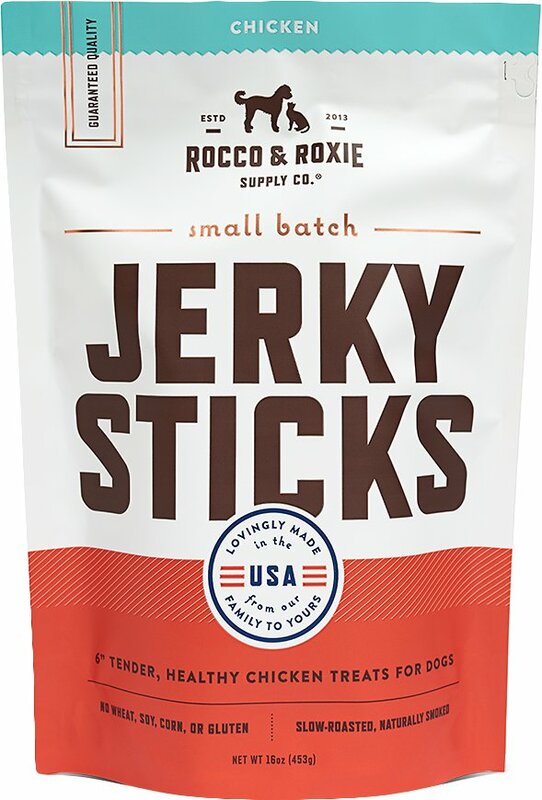 Roxie loves her Jerky Sticks and they have been used to teach her lots of tricks. We are NEVER without them in our home. Thanks for your continued 2 day delivery. Small quantity for a large dollar amount. I think it's a good product but will not be ordering on a consistent basis due to the price. My dog loves them and she's very picky. I will be buying them again very soon. A healthy, made-in-America, chemical, gluten, and grain free treat for my dog, wait - what... I have purchased several treats and if you take a look at the ingredients on most food and treats, you will see things that can cause cancer and disease. I don't want to feed my dog anything that I wouldn't eat myself. These are smoked for 14 hours, so somewhat pricey, but without breaking the bank, plus more sticks than I expected in the bag. Our Baby is very finicky and we about gave up on finding a treat he would eat. 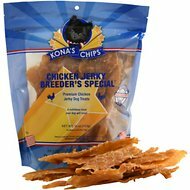 I found your treats on the Chewy site read the reviews and thought we would give them a try.....When they arrived I opened the pouch and noticed that they smelled so good.....I put one on the floor in front of him and turned around to put the pouch away,turned back around and it was gone! Now when he hears you open the pouch he is waiting at your feet. My dogs will do just about anything to get this treat. I do use it for training and for rewards and have been able to see a big difference in their response when I have these in my pockets. I'm happy, as are the dogs, that I can put the treats on a regular delivery schedule.